Renault will introduce a low-cost urban vehicle in China next year — the electric K-ZE, based on the Kwid subcompact crossover sold in India and other emerging markets. The K-ZE, shown as a concept but which is close to production form, will have a range of 250 km under the New European Driving Cycle emissions test. 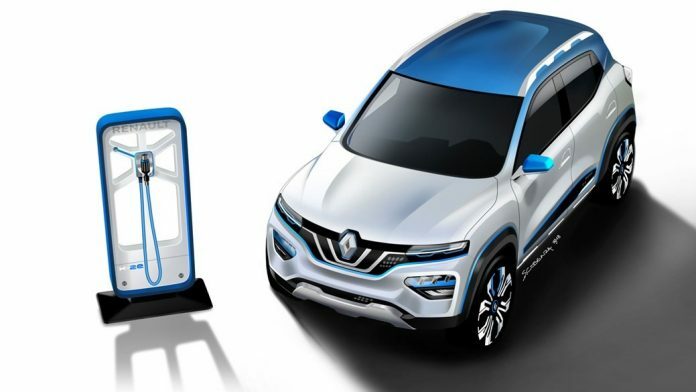 The EV was developed as part of a new joint venture with Renault alliance partner Nissan and Dongfeng Motor Group to build electric vehicles for China, where the K-ZE will be produced. Carlos Ghosn, CEO of Renault and chairman of Nissan Motor and Mitsubishi Motors, would not say what the price would be, although last year he said the K-ZE would cost about $8,000. He said it would stand out from domestic competitors by offering a higher level of features, such as air conditioning, a large touchscreen, rearview camera and parking sensors, and connected navigation and services, Ghosn said. “This is a very strong product, and we’re going to compete,” he said. Renault plans to sell 550,000 cars in China by 2022 under the company’s Drive the Future strategic plans. Last year the company sold about 72,000 vehicles there, up from 35,000 in 2016. Renault has long had a joint venture with Dongfeng to build internal-combustion vehicles, and it also hopes to boost sales through a new joint venture with Shenyang Brilliance Jinbei Automobile Co. to produce and sell light-commercial vehicles. Including the K-ZE, Renault plans to launch three EVs and nine new cars overall by 2022. The Chinese government wants to increase annual output of new-energy vehicles — its term for battery-electric vehicles, plug-in hybrids and fuel-cell vehicles — to 2 million units by 2020, Bloomberg News reported last year. Such automobiles are expected to make up more than one-fifth of total sales by 2025, according to the latest auto industry plan released by the Ministry of Industry and Information Technology. Last year about 25 million cars were sold in China.